I sometimes think that the illustrations I find for my postings are more interesting and certainly more entertaining than the thoughts themselves. I have been fortunate to find many beautiful and perfectly fitting photographs that assist me in the development of my ideas. This can also happen when we read the news, when the photographs are more interesting than the article itself. This is a rare occurence in Le Monde, which contents are very well analyzed and presented. In the recent past, there was a big debate whether any photographs should even be presented in that newspaper. Today, their photos, which are frequently in color, and in large format like the one above, are the most aesthetically pleasing of all the newpapers. Yesterday, I discovered during my Le Monde reading a colorful photograph of Barack Obama by Pete Souza, which amazed me. I even showed it to my children. I told the eldest I would write about it on my blog. 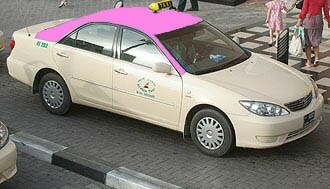 He helped me look for it on google image. We couldn't find it! However, my beloved editor and sister, who is very handy on the computer, took the extra time, and did find it, so that you may all enjoy seeing it clearly, rather than the hazy picture I took of the article on my Blackberry. I am now forever indebted to her! The portrait I chose as my favorite is one of Obama in a regal state. The President of the United States is wearing a shiny blue suit. Two other colors dominate, also bright: the green wallpaper, the thick rug and the red textiled arm chair. There are some decorative fixtures in the room also: a marble mantle on which an antique delicate vase and an ornamental clock, a desk with a vased-lamp, a full glass of water and a pretty centerpiece of flowers. Over the mantle piece you can find a portrait, perhaps of President Washington, who peers over the first African-American President of the United States. The portrait looks like it was staged. Everything is placed in perfect order and the President appears to be posing for his portrait. He is thinking, with his arms and legs crossed, his left hand to his mouth. 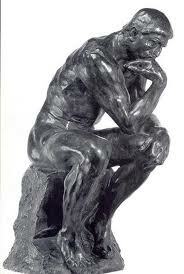 This is the pose of the Thinker of Rodin. I am impressed by the symbolism and recognize the professor in the President. Indeed, he is a leftie and he has made that a cool thing. He is wearing a plastic digital watch. We all know now that Obama has brought back coolness and passion into being American. Look at the presidents of the world and compare. Who has a better image? In this blog we are talking appearances. Are we not examining a portrait? A thinking President, a trained professor. A tall, lean, athletic role model also. This portrait is very American in its setting, reminiscent of a John Sargent painting. John Sargent painted American stately homes and this famous group image of children has all the decorative touches present in the Obama photograph, the same rich carpet, the vases, the furniture. 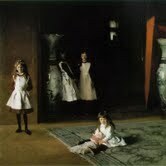 John Sargent's children has been directly linked to the influence of Las Meninas by Velasquez. 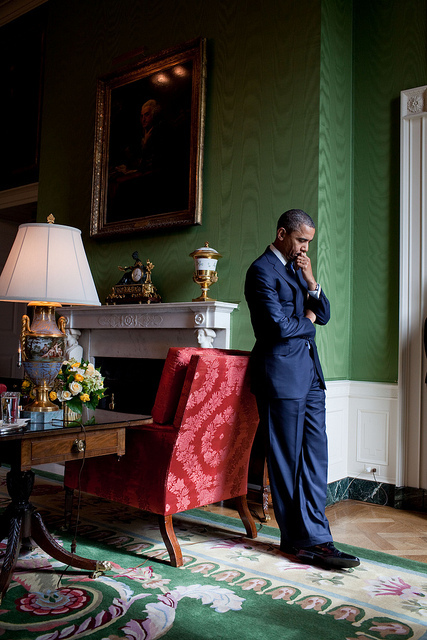 And then the portrait of Obama in his office, regal and majestic also, like a Velasquez painting. I loved the strength I could sense from the portrait. A Portrait or a Picture is worth a 1000 words,especially the colourful one described and disected by the blogger.I always look at subjects within my frame of mind,and many times I wish I had my camera ready to shoot.Luckily now we have our phone cameras,some of 5 pixels or more,yet they are still fuzzy,and dont capture the moment. Obama came as a fresh breath of air,yet is proving to be not a strong wind of change.The dreamy 44th President,might prove to be a one-term president,but will always be remembered as a decent,intelligent and sensitive leader.